I have a tendency to be sucked in by those delicious looking cooking videos that are constantly popping up on my Facebook screen and as often as not, they're so tasty that I share them to my wall so that I can find them later. As a result, and because most of my friends know that most of the kids in the house have some kind of food allergy that wouldn't work with 99% of those recipes, I have a lot of people who have asked, or commented about how funny it is that I pin these recipes when most of the people in the house can't even eat them (and don't feel bad if you've asked! So many people have been curious about why I save all these recipes, so I wanted to share!). The truth is though, that 9 out of 10 times I'm not filing them away to whip them up as they appear in the videos (that tenth time I totally am and I actually am planning on baking and making the sugary monstrosity when the kids are already tucked into their little beds). Most of the time I'm saving the video for ideas, because over the past three and a half years since we became an allergy family and I began desperately searching for gluten free and casein free recipes, I've learned a few tricks so that I don't pull out my specialty cookbooks all that often anymore. I'm far more likely to take a regular recipe and substitute things that I know are gf/cf and adjust things so that it works out. At the moment I'm far less into baking "from scratch" than I was three years ago (let's blame the baby bump that forces me to sit down more and more often for breaks) and so I appreciate mixes far more than I did when I first started out. And since I've discovered Aldi and their Live Gfree products (although always double check if you're dairy free, because not all the Gfree products are...) making many of these recipes has become even more affordable and fun (and no I'm not being sponsored by Aldi to say that... I'm just grateful that they've cut my grocery bill by more than 50% since I started shopping there last year). 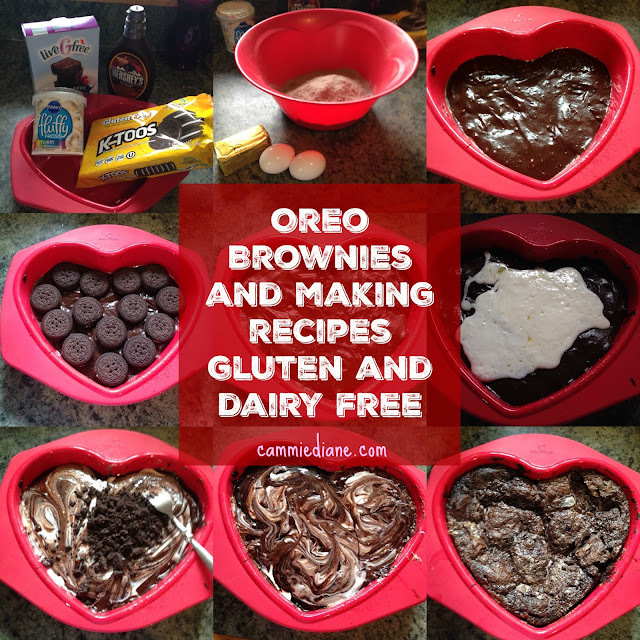 This particular recipe was a brownie Oreo concoction. The only thing I didn't already have to the recipe in my cupboards were GF Oreos, so I made a note to pick them up at the store. And then I had everything that I needed. So I added a bit more frosting. And I baked per the boxes instructions. These brownies were definitely a hit! I think the one thing I've learned over these last few years of baking is not to be afraid to experiment and try to substitute in gluten free and casein free options for regular cooking supplies. There are certainly some misses (or at least recipes that aren't as pretty as the ones in the photos) but there have been many hits as well. So if you are cooking for those with allergies and you want to try something knew, remember that inspiration can come from more traditional sources! And if you know me I'm not just being mean baking things my kids can't eat! It's allergy baking inspiration! I'm so glad you found Aldi's. Their products are good, and often cheaper (but not always, so make sure you know prices at a few stores) than comparable products at the regular grocery store. And I really can tell no difference in taste between their most of their products and the more well known brands. I have another blogger I read that for the past year she is now gluten free b/c of allergies and their son is allergic to milk. Her recipes look amazing. I'll admit I'm a bit bias because she lives in the same city I do so it's fun to see the stores she gets her ingredients from b/c I shop there, too. I don't know how many gluten free blogs are out there but this one is pretty great if you have time to check it out! I'm glad you found some brownies everyone can get. They are my go-to dessert!